Moved by Trinity School’s Grade 4 students’ recent service learning project focused on Ebola awareness and education, a local family has anonymously generated donations to the country of Liberia in the Trinity students’ names. The donation of 20 Ebola worker protection kits and $30,000 worth of medical supplies is through MAP International, a global Christian health organization that partners with people living in conditions of poverty to save lives and develop healthier families and communities. Service Learning, the school program that promoted the students’ interest in the Ebola crisis, is integral to Trinity School’s mission. Guided by Kim Thacker, Service Learning Coordinator, Trinity students identify and research local and global issues. Trinity’s Grade 4 students chose to examine this difficult issue, sparked by their commitment to confronting problems that hurt children. 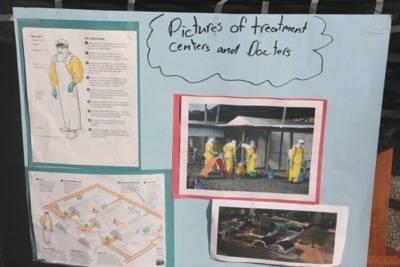 The students researched the cause and symptoms of the disease, the building of special treatment centers to help treat and contain the disease, and the dedicated medical personnel helping to care for Ebola patients; they mailed cards to thank these workers for their bravery and commitment. The students were especially intrigued by the complexity of factors leading to the severity of the Ebola outbreak. They learned about impoverished areas where people seek widely for food, and they grappled to understand why some people are afraid to get treatment, as well as the burdens imposed by being separated from families. For their efforts that inspired the generous donation, Grade 4 students received a personal letter from the Consulate General of The Republic of Liberia, acknowledging the students’ work in bringing awareness to the Ebola crisis that faces the children and people of Liberia. The Consulate General greatly appreciated receiving the cards, reading the students’ stories, and viewing their presentations on YouTube.